Spee Dee, Model CBE264, (4) pocket volumetric filler rated from 6 to 48 indexes per minute with number of containers – depending on materials, application and machine configuration. Cup size range: 1" to 4½" in Diameter; 0.62" to 20" in Depth. Fill range: 2 to 1250 cubic inches. Equipped with 12" ID x 16" Deep stainless steel conical product hopper and 13" OD plate with (4) fill pockets. Mounted on a stainless steel base with foot pedal controls. Change parts required to accommodate size range. 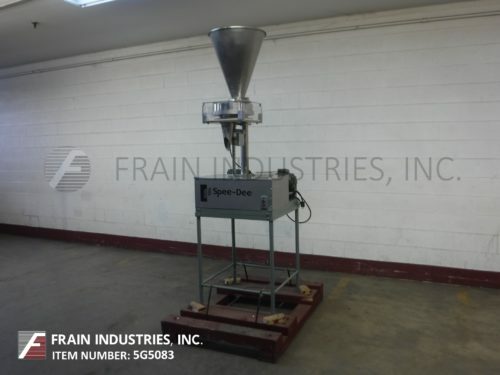 Spee Dee, Model 3500S, semi automatic servo driven single head auger filler with volume of product per hour – depending on materials, application and operator dexterity. Equipped with 18" diameter x 15" deep stainless steel seamless product hopper with bolt down cover, 5½" x 6" oval shapped product in feed chute, variable speed and foot pedal. Control panel has Digitronics controller with touch pad controls and panel view with e-stop and mounted on "H" stand. Spee Dee, Model CB6E-231W, 6 pocket volumetric filler. Rated from 6 to 120 indexes per minute with number of containers – depending on materials, application and machine configuration. Fill range: 0.5 to 5.5 cubic inches. Equipped with 11" diameter x 15" Deep, stainless steel, agitated conical product hopper, 12" diameter filling plate with (6) ½" ID x ½" Deep product pockets, product discharge funnel. Control panel has General Electric controller, with push button start / stop controls and variable speed controller. Mounted on heavy duty base frame. Fill Volume Range: 0.5-55 cu.in.